The NdFeB magnets are the strongest magnets available. Up to +150 degrees C, they are stronger than the other Rare Earth magnet, SmCo. At around +150 degrees C and above these Neo magnets perform not as strongly as SmCo. 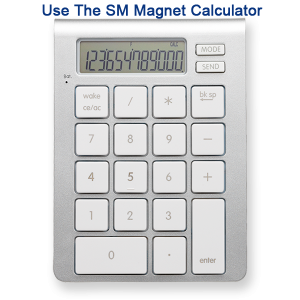 The maximum recommended temperature for the NdFeB magnets is +230 degrees C, whereas the SmCo can work at +300 to +350 degrees C.
NdFeB can be used at low temperature but at around 135 Kelvin (-138 degrees C), the direction of magnetisation is said to change from a single axis (easy-axis) to an easy-cone which could cause a fall in output of up to 15% due to this spin reorientation. It is possible to use Neodymium Iron Boron magnets to be used at even colder temperatures but this drop in output will need to be taken into account. The temperature coefficient of Intrinsic Coercivity (how Hci varies with temperature), b, for Neodymium is approximately -0.6%/degree C (from ambient, but a range of -0.45%/degree C to -0.6%/degree C is possible depending on the Neodymium grade) between +20 and +120 degrees C.
The temperature coefficient of Remanent Induction (how Br varies with temperature), a, for Neodymium is -0.12%/degree C (from ambient, but a range of -0.08%/degree C to -0.12%/degree C is possible depending on the Neodymium grade). It should be noted that, strictly speaking, these values for a and b actually vary with temperature and use of stated values beyond 20 to 120 degrees C may result in inaccuracies when designing (actual BH curves at temperatures assist in clarifying for design purposes).